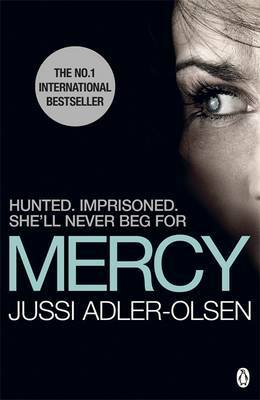 MERCY is an excellent debut from Denmark, containing all the elements I like best in crime novels. First, there is a fully rounded detective, Carl Mørck, not only disillusioned, traumatised and lazy but who has lived before the first page, both at work and outside it. Second, there is a believable depiction of the police force, including personal interactions between colleagues and plenty of bureaucracy and politics, infused throughout with black humour. Third, there's a good plot - Mørck is insubordinate and has constantly annoyed his superiors, but cannot be sacked as he's served for many years and has recently been seriously wounded in the course of duty. Therefore he is hived off to set up and run a cold-case department (Q), code for sticking him in the basement and forgetting about him while the mainstream force spends Q's assigned budget on its own investigations. The "cold case" theme has provided a fruitful line for other fictional detectives, and looks set to do the same for Mørck. Together with his newly assigned assistant, Assad (an intriguing character in his own right), Mørck gradually comes back to life via the top file of the many in the pile on his desk, which he gives to Assad to read to give the man something to do after he's finished cleaning the office. Assad asks him questions about the contents, so against his own inclinations (which tend more to sleeping at his desk and playing constant games of solitaire), Mørck becomes intrigued as he comes to realise how badly the case was originally handled. This sets up a nice tension between Mørck and the star detective at the station, who gradually has to concede not only that his previous work was flawed but also has to put up with Mørck's casually delivered comments that essentially solve his own stalled current case. Mørck's own tenacious investigation is infused with sympathy for the less able members of society whom he encounters, as well as providing plenty of tension as (unbeknownst to him but revealed to the reader) Mørck is in a race against time before disaster strikes. One aspect that I particularly like is that, although the plot involves that hoary old staple, an imprisoned woman, the woman herself is the strongest and most likeable character in the novel. She refuses to give her kidnapper(s) the upper hand for a moment, even though she is in an extremely desperate situation; her small acts of heroism (such as how she manages to clean her teeth) and rebellion to keep herself sane have us cheering her on. The cliche would be to portray her as a passive victim, or to dwell on her suffering in a voyeuristic way, so my hat is off to the author for choosing an empowering route. There are many other elements of MERCY not mentioned in this review that combine to make it a gripping novel which I cannot recommend too highly. It is early days yet, but this book is the nearest I have experienced to the superb Martin Beck series by Maj Sjowall and Per Wahloo. Like those classic novels (which many, including me, regard as the foundation of "modern" crime fiction), there is a strong police-procedural element involving a group of colleagues in the police force and their associated staff; there is plenty of social and political comment exemplified by the police themselves as well as in this particular novel's theme about government officials and their culture; there is a genuinely interesting set of characters in Mørck's personal and professional life; and there's a solid crime plot (not too hard to work out the who and why, given the dearth of possible suspects, but never mind!). Throughout, the author conveys emotions and relationships with empathy, yet he pulls no punches in that lean, focused style so effectively used by Sjowall and Wahloo. Altogether, MERCY is shaping up to be the best crime novel I've read this year. A final note, MERCY is expertly translated by Lisa Hartford (who as Tiina Nunnally has superbly translated many previous Danish, Norwegian and Swedish novels, including Peter Hoeg's classic MISS SMILLA'S FEELING FOR SNOW). The translation here, in American English, naturalistically conveys the black humour that infuses the book, as well as the affecting relationships between Mørck, his hospitalised colleague, Assad, and his family and neighbours.